New Augmented Reality Geocaching Launched. So many possibilities! Ever more I find myself exploring the booming realm of augmented reality, especially when it can be applied to gaming or puzzle-creation. We’re inching closer to some really special, and most importantly, accessible use of the technology. Recently I attended GeoWoodstock in Cincinnati, an annual gathering of geocachers that has grown to record-breaking size. 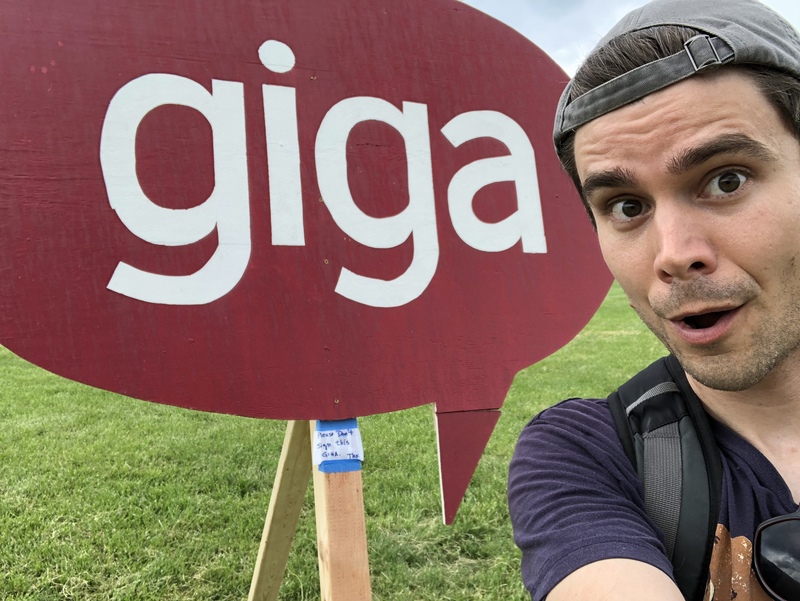 So much so, that this year it became the first ever “Giga” geocaching event to occur in the United States with something like 12,000 attendees. It was a fun event though, frankly, the fun of such events usually comes not at the event itself, but running around exploring an area where seemingly everyone you meet is into your weird hobby. I achieved a few personal geocaching milestones in Cincinnati and had a blast doing it. At these large geocaching events there sometimes are special, one-off geocaches called “lab caches”. They tend to be quite experimental considering the fairly conservative structure of geocaching and are only available at that event. Even so, at least among the 30 lab caches I had done preceding this GeoWoodstock, they have not been terribly exciting. They typically lead you to a place, ask you to find a plaque (or the like) there, and then you plug into a special website an answer that you discovered from reading said plaque. That’s not to say that type of puzzle is easy to create. It’s very close to what I do for a living (and I’ve specifically written about the difficulty of creating that kind of puzzle here), but that definitely means it takes more to impress me. I know, how very special I am. There was something intriguingly new at GeoWoodstock this year, however, and it ties back into the lead of this post. Some of the lab caches used augmented reality. It wasn’t fancy augmented reality and at the time, except for one important detail, I found myself scoffing a bit. Later, after hearing the creators of these lab caches on the Geocache Talk Podcast talk about their thought process for creating these experiences, I toned down my haughtiness. They designed this augmented reality to function in the middle of an amusement park rented out to an event where thousands of data-using technology nerds would be converging with dozens of possible devices. The fact that it worked at all is impressive. I’ve got it on video below but this augmented reality geocaching had you point your phone at illustrations scattered around the area and lightly animated keywords would appear on your screen. You’d enter the keywords into a separate webpage to confirm that you completed the lab cache. Again, nothing particularly fancy. The amazing part is that this was all done via your phone’s browser, not a downloaded app. I’ve used augmented reality in a few projects, always knowing in the back of my mind that their success would be limited. People don’t want to download apps for one-off experiences. They just don’t. Having working augmented reality in a browser is huge and could really open up a lot of opportunities. Most surprisingly, not long after GeoWoodstock, Geocaching.com quietly released a beta period of sorts allowing augmented reality geocaching. I guess I shouldn’t be all that surprised, the market for similar experiences has suddenly become very crowded. Geocaching.com better start thinking toward the future or they’ll soon be in trouble. My geocache uses an app called Zappar that I’ve used for other projects. Zappar relies on what are essentially mega-charged QR codes. What I especially like about Zappar is that users don’t need an account to use it– they just download the app and point their camera at things. Like I said before, people already don’t like downloading apps and at least with this one, you don’t have to give out your info to use it. Time will tell as to what Geocaching.com plans to do with these geocaches long term. A new, official cache type? Delete them all? Grandfather in the most favorited among them? In a weird way though, the vagueness of this beta period somewhat restrained what I did with my geocache. I didn’t want to invest too much time in creating a huge experience if it was just going to vanish in a few months. We shall see. The community is abuzz with possibilities.